Natural component of muscles, the brain, and other innervated tissues. Involved in the contraction of muscles, including heart tissue. 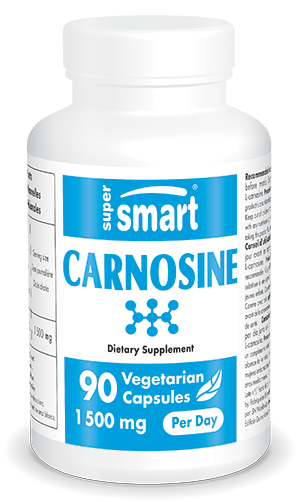 Carnosine, or l-carnosine, is a peptide formed naturally by the body during digestion of protein-rich foods. Abundantly present in muscle and brain tissue, it is primarily involved in the contraction of various muscles and tissues including that of the heart. Damage to proteins is one of the key mechanisms of ageing. Essential for the body to function properly, proteins are destroyed by either oxidation (free radicals) or glycation (a reaction with glucose molecules). Skin ageing is the most visible sign of protein damage, manifesting as wrinkles, loss of elasticity and reduced healing capacity. But the visible changes to the skin also reflect those affecting the whole body - muscles, blood vessels, the eyes, the brain and many other organs. When too many proteins cease to function, the body ages prematurely and becomes the target for degenerative diseases. Studies show that the amino acid carnosine is the most effective antioxidant against the hydroxyl radical (proteins' no. 1 enemy) and the most powerful inhibitor of the glycation process which caramelises' proteins through cross-linking. Research also shows that carnosine levels in muscles drops by more than 63% at the age of 70 - which could explain the decline in muscle mass typically seen with advancing age. The reduction in carnosine in the body, associated with increasing oxidative stress and reliance on high-carbohydrate diets, makes supplementation desirable, if not essential. We believe carnosine to be the most important new product to appear in recent times in the field of nutrition. We're cutting its price significantly as we're keen it should not be prohibitively expensive to a wider market. Carnosine is one of the few nutrients with powerful, pluri-potent and proven activity. Carnosine is concentrated in the brain and protects it from glycation, cross-linking, oxidation and excitotoxicity. It protects cerebral capillaries from damage caused by amyloid beta (seen abundantly in Alzheimer's disease), lipid peroxides and metabolism of alcohol. Carnosine extends the longevity of senescent cells, enabling them to continue dividing for longer, like young cells. In one in vitro study on fibroblasts (a type of cutaneous cell), longevity increased by 67%. Carnosine is even more effective as an anti-glycation agent than aminoguanadine and can prevent the development of cross-links in collagen. Carnosine is effective at treating senile cataracts, and at slowing down cataract development (as shown in studies on dogs and rabbits, respectively). Carnosine is one of a small group of substances which can extend the lifespan of mammals: mice treated with carnosine survived 20% longer than controls. In addition, they looked younger and their brains had significantly less malondiahyde (MDA) and monoamine oxidase B (MAO-B) than controls, indicating more youthful metabolism of dopamine. Carnosine reduced peroxidation of cerebral lipids by 85% in mice subjected to intense stress, and increased six-fold the protective antioxidant activity of superoxide dismutase (SOD) in their brains. Carnosine is without doubt the most promising, multi-functional discovery of the past few years in the field of anti-ageing nutrition, influencing our longevity of our bodies as a whole, as well as at a cellular level. Research shows that it helps maintain the structural, functional and genetic integrity of the body - naturally and with no toxicity. As a result of its antioxidant potency and anti-glycation effect, carnosine is sometimes considered as an anti-ageing treatment. It continues to be the subject of numerous studies on its benefits for slowing down the body’s ageing process. Scientists are focusing on its potential for delaying ageing of the muscles which can manifest in muscle weakness and loss of muscle mass, also known as sarcopenia. Some studies have demonstrated significant activity from carnosine at relatively low doses, around 150mg a day. Others show superior activity at higher doses - 1000-1500mg a day - levels at which the enzyme carnosinase (which damages carnosine) becomes saturated, making free carnosine available to the whole body. Other dietary supplements may also be of interest to help boost the protective effects of carnosine. The synergistic formulation AntiOxidant Synergy, for example, provides the antioxidant potency of numerous compounds including curcumin, a much-prized ingredient in Ayurvedic medicine, alpha-lipoic acid, known as the ‘hyper-antioxidant’, and glutathione, a key endogenous antioxidant. Other ingredients: magnesium stearate, silicon dioxide, magnesium oxide. Each vegetarian capsule contains 500 mg of L-carnosine.